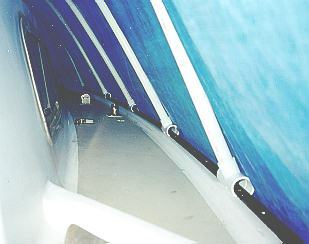 This photo shows the track "cars" that secure the cover frame latterals to the stbd gunwale t-track. The "cars" can be slid for/aft to position the latteral. (See the Maintenance Log for 11/27/96- 12/7/96.